ode to pomegranate | thoughts. I’ve been craving strawberries lately. . . . Longing for those days last summer when I’d bring a tupperware bursting with raspberries, strawberries, and cherries to work every day. It was better than candy, even chocolate. There is nothing like in-season fruit. Right now, in the dead of winter, I eye berries at Cub suspiciously, as if they’re imposters . 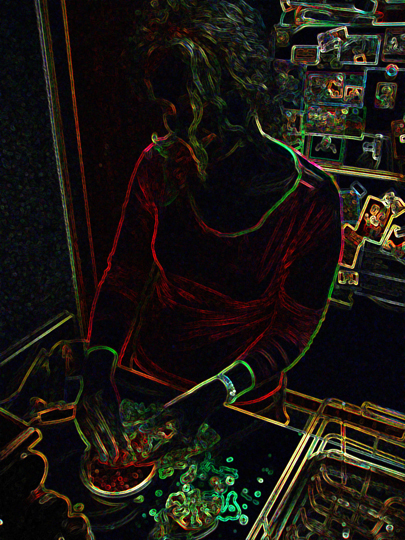 . . what right do they have to be readily available when they taste like shadows of their real selves? At least I can welcome oranges. January would be a much darker month without oranges. Around Christmas time, I asked Marshall if he could pick up a pomegranate from Cub, as a Christmas treat. I don’t know whether they’re “in season” or available because they’re considered a holiday fruit, but I wanted one just the same. 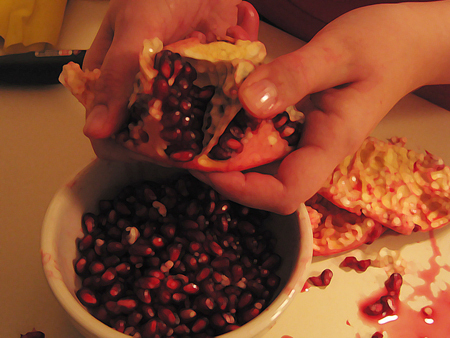 Halfway through the de-seeding I realized that the author of How to Cook Everything was correct when he said that pomegranates were a lot of work (I initially scoffed at the warning). My hands looked like a bloody mess by the time I was done, warm and sticky juice staining my nails and countertops. After the first shedding of a clump of arils (the seed & flesh that surrounds it) I wisely changed into an old shirt. It also happened to be pink, and although I managed not to stain it anyway, little flecks of juice ended up on the lightswitch on the wall hovering over my fruit-opening work area. Although it took time to release all 600 seeds, I was surprised at how easily they could be scooped out, without requiring too much pressure. It was still a delicate task; the clusters reminded me of raspberries, how little concave sections can fall into your hand if you don’t grab the whole berry off the vine just so. After cleaning up and bleaching the countertop, Marsh and I ate them by the spoonful. I originally spit out the chewed-up white seeds, treating them like the seeds of large grapes. He eventually convinced me that they were perfectly edible and wouldn’t lodge in my throat. I was a little frustrated that such tiny beauties had so little surface area of sweetness and so much seediness. Why, for a fruit that is so special, why can’t the ratio be a little more pleasing. Or, rather, why does the sweetness disappear so quickly in the mouth. But maybe that small burst of intense flavor is a lesson in stepping back from instant gratification. 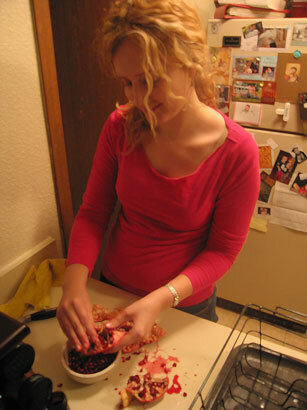 There is something serene and sacred about opening up and shelling out a pomegranate. Although, I think I’ll be looking for pomegranate juice from now on and attempt to find pomegranate molasses in a Middle Eastern grocery someday (an ingredient my cookbook said is a great way to incorporate the fruit into your meals). i smiled at the phrase “bloody mess” you meant it actually looked bloody, i assume. but i smiled at the double meaning, which you also may have done intentionally? :) we didn’t bake apple pies and walk the streets of norwich together for nothing!